A few months ago, I started becoming more conscious of all the bad ingredients in the everyday beauty products in my routine. After some research, I made the decision to start eliminating Paraben in particular from my routine. Paraben has been linked to breast cancer and is generally just not good for you. The more natural the better. Although I haven’t made the full switch to Paraben free products in my beauty routine, all the products I use on my body, such as shower cream, body lotion are currently Paraben free. As for deodorant, it wasn’t just paraben I wanted to eliminate, but aluminum too. I knew from the start that I wanted to opt for a natural deodorant so I started testing a few. When it came to switching to natural deodorant it was a long process. The main purpose of a deodorant is to keep you smelling nice. Unfortunately, more natural options aren’t as powerful as chemically filled options. I started my natural deodorant journey by picking up the travel size LaVanila deodorant from Sephora to test it out. It smelled faintly of vanilla and didn’t leave a residue. But unfortunately, it didn’t stop the sweating at all. I’m not a sweaty person per se, but I found that after a few hours, I would start to notice a smell. So it was a no! Next up was Tom’s deodorant. This deodorant had a waxier finish. Almost felt wet when applied. Again, on those hotter days or when I’m moving frequently, I’ve noticed I started to sweat. Also, it didn’t do much for the smell. It was better than the LaVanila deodorant as its effects lasted much longer. But, I wasn’t impressed. 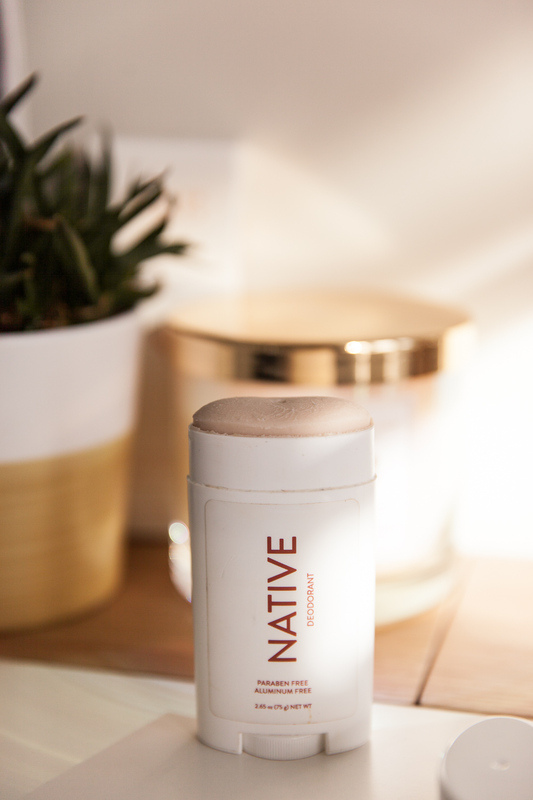 So, I decided to try the cult favorite, Native deodorant. This one felt more like the LaVanila on the skin, meaning it’s a drier formula, but not drying to the skin. It is by far my favorite natural deodorant between those three. I’ve noticed some sweating after a few hours on hot summer days, but it helped a lot with eliminating the bad smell. I can’t say it’s as good as a chemically filled deodorant that completely eliminated bad smells. Honestly, I don’t think there’s ever a natural deodorant that’s going to be able to do that and I’m fine with it. I feel confident wearing it but I do need to reapply during the day on warmer days or when I’m doing a lot of activities. It didn’t leave a white cast on my clothes which is also a plus! I much prefer refreshing with a wipe and reapplying a natural deodorant throughout a hot day than smother my underarms with bad chemicals. If you haven’t made the switch to natural deodorant I urge you to maybe give it a try. I’ve been working on choosing more natural products for my beauty and makeup. I haven’t tried this deodorant yet so thanks for the recommendation! You’re welcome. Deodorant and body lotion are some of the most important products because they get absorb most by the skin. It is the best natural deodorant I’ve tried so far for sure! Looks like an amazing deodorant! It’s the best I’ve tried yet! Let me know when you try it how you like it! I actually did laser hair removal for my underarms a few months ago and finished the treatment but I’m very unhappy with the results. I’m now looking for a new an better place to redo it. I usually make my own natural deodorant since it is pretty easy to make and doesn’t take much time but when I do purchase natural deodorant I usually purchase the brand Schmidt’s. I will have to check out the brands you listed to see if I can add them to my list. I need to find a recipe for at home natural deodorant. I haven’t tried Schmidt’s before, I’ll add it to my list!